This article is about the theological phenomenon. For the 1992 Australian film, see Backsliding (film). For the dance, see Moonwalk (dance). 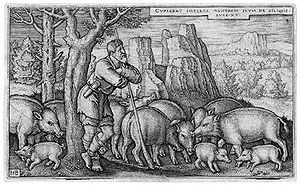 Engraving of the Prodigal Son as a swineherd by Hans Sebald Beham, 1538. Backsliding, also known as falling away or committing apostasy, is a term used within Christianity to describe a process by which an individual who has converted to Christianity reverts to pre-conversion habits and/or lapses or falls into sin, when a person turns from God to pursue their own desire. In Christianity, within denominations which teach Arminianism, such as the Methodist Church and Pentecostal Holiness Church, as well as in the Roman Catholic Church, backsliding is a state in which any free-willed believer is capable of adopting. This belief is rejected by Calvinists endorsing the perseverance of the saints doctrine. In these denominations, it is taught that the backslidden individual is in danger of eventually going to Hell if he does not repent (see Conditional security). Historically, backsliding was considered a trait of the Biblical Israel which would turn from the Abrahamic God to follow idols. In the New Testament church (see Acts of the Apostles and Christianity in the 1st century), the story of the Prodigal Son has become a representation of a backslider that repented. The term was coined during the Reformation. The Oxford English Dictionary cites the earliest usage to John Knox in his 1554 pamphlet, A Faythfull Admonition to the Professors of God's Truth in England. It was used in the King James Bible in Jeremiah's plea to Israel to drop its "faithless" or "wayward" habits in order to resume a relationship of loyalty to God (Jeremiah 3:22). ^ Ernest Frederick Eilert (1910). Luther league review: Volumes 23-34. Luther League of America. In spite of this covenant and God's many promises, Israel was constantly falling away — backsliding, but the time of the final backsliding came and God spoke to them through his prophet: "Return, ye backsliding children." ^ B. J. Oropeza, In the Footsteps of Judas and Other Defectors: The Gospels, Acts, and Johannine Letters. Apostasy in the New Testament Communities, Volume 1 (Eugene, OR: Cascade Boos, 2011), 1-2. ^ Rice, John (1943). Backslider. Sword of the Lord Publishers. ISBN 0873980506. Retrieved 14 June 2012. But one who is truly born again, a child of God who falls into sin, is a backslider. It may be outrageous and gross sin known to everyone, or it may be merely coldness of heart, a lukewarmness of heart instead of the burning fire of love for God. But when a Christian loses any of his joy, or loses part of his sweet felloship with God, or falls into sin, then he is a backslider. ^ a b Loyal Jones (1999). Faith and Meaning in the Southern Uplands. University of Illinois Press. ISBN 0252067592. Retrieved 14 June 2012. Sanctification and Backsliding I have often heard the term "to backslide" in Arminian-type churches, such as Methodist and Pentecostal-Holiness, and it is linked to the idea of perfection, the notion that if you are truly saved, you may have a second blessing-sanctification-that can perfect your life and enable you to live above sin; conversely, if you do sin, you have backslid from what is expected of you as a Christian. It is preached further that if you should die while you are in such a lapsed state, you are in danger of going to hell. ^ Thomas Langan (1998). The Catholic Tradition. University of Missouri Press. p. 214. ISBN 0826211836. Retrieved 14 June 2012. Protestants and Catholics alike today distinguish clearly "justification" from "sanctification" And all agree that our sanctification begins with the forgiveness of sins through God's totally gratuitous act, that through subsequent sinning we can "backslide," and that God further extends His forgiveness, and helps us back up onto the difficult road to personal sanctity. ^ Burton-Edwards, Taylor (2012). "Do United Methodists believe "once saved, always saved" or can we "lose our salvation"?". The United Methodist Church. Archived from the original on 1 December 2012. Retrieved 14 June 2012. But we can “fall away” from it. Or to use another metaphor, we can move so far from the saving streams of God’s love and power that we parch and spiritually die. The consistent focus of Wesley’s teaching, however, is far less the warning about the possibility of such death and thus ultimately Hell (though he does not shrink from offering such warnings upon occasion, even as noted in the quote above), but rather upon the consistent, unfailing grace of the God revealed in Scripture and in the person of Jesus Christ, the God who is abounding in mercy and steadfast love. ^ Milton Jacob Firey (1901). Infant salvation: or, The passivity of infants, the key to this perplexing subject. Funk & Wagnell's. Retrieved 14 June 2012. The prophets refer to the idolatry and wickedness of Israel and Judah repeatedly, but always as the wickedness of those who were once in a state of grace. Their sin is that of "backsliding," "departing from God." This is the case even where the whole nation is addressed. Hosea says" "Ephraim is joined to idols, let him alone" (Hosea iv:17). By Ephraim is meant all that belonged to the ten revolted tribes-all Israel. This idolatry which joins them to idols the same prophet denominates "backsliding." "And my people are bent to backsliding from me" (Hosea xi:7). ^ Alexander McConnell; William Revell Moody; Arthur Percy Fitt (1899). Record of Christian work, Volume 18. Record of Christian Work Co. Retrieved 13 June 2012. The tenderest, yearningest words of Scripture are for backsliders. Remember the parable of the prodigal son is a backslider's parable. ^ a b Nancy Bermeo (January 2016). "On Democratic Backsliding". Journal of Democracy. 27 (1): 5–19. This page was last edited on 23 March 2019, at 04:55 (UTC).